That’s one reason why I watch TV at all. Because TV is filled with unknown gods. Sometimes they aren’t so explicit, but this last week when we burned through Stranger Things, it was readily apparent. The Netflix original show is a 1980s’ style horror serial drama set in the Midwest that documents four boys, one gone missing, and the three boys’ and their family’s journey to find him. 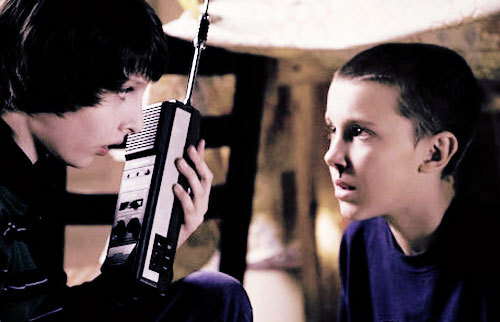 Along the way they encounter Eleven, or El. She has marvelous powers, both that frighten and impress people around her, while simultaneously exhausting her. It’s a dramatic show, and for me, pretty captivating. I’ll spare you the spoilers this time, but El is the misunderstood hero of the story. Abused by the state government (from which her friends are trying to save her), El is a humble, unassuming child, possibly with the power to save the world from the Demogorgon. It’s a typical plot, and just like Harry Potter or Star Wars, there’s an idealized hero, that has to overcome personal limitations in order to save the world. Or at least the town. We have a fascination with saviors saving us, it seems, and I do not think that is a coincidence. One looks around the world and sees the horror that surrounds. We do not know how it will get better. But we long for it to, don’t we? So then, Netflix produces a show that hyperbolizes that horror (the Department of Energy was quick to distance itself from the goings-on of the show) and one that potentially has a redemptive narrative with a loveable hero. They want the story, let’s tell it. Well, like Paul in Athens, I want to tell you that the unknown god that these dramas depict is none other than Jesus. He literally saved the world from its horror. He defeated death, worse than the Demogorgon. The most dramatic “atonement explanations” tell a story of this drama (think the Ransom theory or Christus Victor) and I think help fulfill that longing for a savior that we have. The story counts, it’s not just about facts. The story fulfills a need that we have for a savior, the story of the Gospels, as Stranger Things replicates it. I hope that this encourages you to tell the story of Jesus then, and to live it out. Sometime we are ashamed to share it, but if the popularity of the show is any indication, people are longing for a Savior and many of us know that very savior. Free yourself from shame. Be like Paul. Tell the story.